Set of 1 Pipe Bag, 1 Base Bag, and 1 Drape Bag. Each bag is made out of heavy duty Canvas material. Choose the Storage Bag Set Size based on the longest pipes that you will be storing (6 feet, 8 feet, or 10 feet), and the base size that you will be storing (16" x 14" or 18" x 18"). Pipe Bag - holds up to 16 pieces of 1.5 inch diameter Upright and/or Drape Support Rod pipes, or up to 7 pieces of 2 inch diameter Upright pipes. We do not recommend exceeding 35 pounds of weight per pipe bag. Features a convenient handle that slings over your shoulder for easy carrying. Has hook and loop fastener flap on one end for closing. Base Bag - 16" x 14" size holds three to four 16" x 14" (10 lb.) bases. 18" x 18" size holds two to three 18" x 18" Lightweight (17 lb.) bases, or one 18" x 18" Heavy Duty (35 lb.) base. Features a hook and loop fastener flap closure, and does not have a handle due to the weight of the bases. Drape Bag - holds between 8 and 20 panels of neatly folded 8 foot tall drapes. The capacity depends on the fabric. Heavier, thicker drapes like our Commando or Velours would be on the lower end of that range, mid-weight drapes like Premier would fit approximately 12 drapes, and lighter weight drapes such as Banjo, Sheer Voile, or Economy Non-FR would be toward the upper end of that range. Features a convenient carrying handle. All bags are Light Tan / Natural in color. So the long storage bags for the pipes are great! These should keep the pipes clean when they are not in use. However, the bags for the base plates are really nothing more than dust covers, because you can't really carry any plates in the base plate bags without ripping the bag. Also, the draping bags are nothing more than large canvas bags (think large reusable grocery bags). 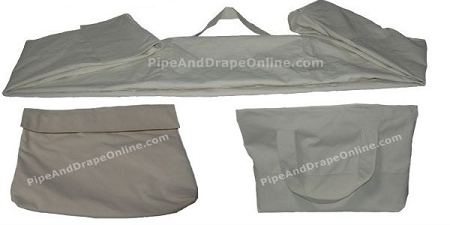 Although the pipe bags are really great, if I had to purchase again, I think I would likely use a larger sized rolling duffle bag for the drapes instead of the included drape bags and probably no bags at all for the baseplates. Thank you so much for your feedback, Joe. We greatly appreciate insight from our customers in how we can better our products. We are planning on new ideas for economical base storage solutions, particularly for heavy weight 35 pound bases like the ones that you purchased. We appreciate your comments, and thank you again for your review! The cardboard box the system originally shipped in was breaking up. The storage bags are very well made and make it all easy to carry and store. Good investment. The bags are mostly functional and not at all stylish. The drape bag holds all of my drapes plus table cover and skirt I ordered. I ended up returning the base bag as it wasn't very practical being that it has no handle. And I had to return the pipe bag for a smaller size as the one I was recommended via customer service was way too large. The kit I got had all interlocking parts, so none of them are over 4.5 ft long... and an 8ft bag SWALLOWED them! If I had the proper equipment I probably could have made 2 bags out of it LOL Overall they were well made and feel sturdy and substantial and will get the job done! This item is not machine washable or dryer safe. Spot clean only with a rag or towel using cold water with no detergents or bleach. Hang to air dry, avoiding direct sunlight if possible.